Project obstacles and solutions: New construction of Section 4 of the I-69 project will connect Crane to Bloomington, Indiana. This stretch of highway is due to open at the end of 2014. Early work on piers and bridges got underway during the summer of 2013. IMI Concrete set up a temporary dry mix plant outside of the construction site in Crane, Indiana to supply concrete during the duration of the project. Key to the INDOT mass concrete specifications was the temperature of the concrete upon delivery to the construction site. INDOT defines mass thermal concrete as any cast-in-place concrete structure with a minimum dimension over five feet. At issue is the ratio of the concrete’s inner core temperature compared to the outer surface temperature. As the cement hydrates in concrete, it chemically heats up. If the core temperature heats up too much as the outer concrete cools, thermal cracking can occur. Also at issue is the maximum temperature of the concrete as it cures. INDOT requires that mass concrete not exceed 150 degrees F at any point in the curing process. It must be delivered to the job site between 40-70 degrees F.
IMI supplied concrete for nine piers during the fall of 2013. Each pier had between 500-750 cubic yards in the base foundation with columns and a cap. All of the components of the piers were under the INDOT mass concrete specifications. QC/QA personnel tested the concrete delivery temperatures regularly to ensure the concrete met INDOT's temperature allowances. The challenge was to work with the changing weather conditions during each pour and to adjust the mix accordingly. When the ambient temperatures were high, IMI used ice and chilled water to lower the overall concrete temperature. Mix designs and materials were adjusted to hold the heat below the maximum allowable temperatures. On top of controlling the temperature tolerances, IMI still had the normal INDOT state specifications on air and slump. Construction traffic was directed down a maze of back roads and one lane provisional roads to get to the construction site. Depending upon traffic, drive times could vary 15-20 minutes. With the drive time and temperature tolerance it was even more important to ensure the timing of the trucks was perfect so that they didn't sit on stand-by and gain temperature. The piers were poured with two trucks feeding a concrete pump throughout the pour. 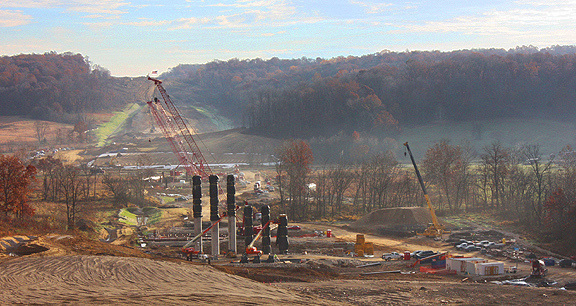 In total, IMI will provide over 23,000 yards for the piers on Section 4.